The new CASETTA Watchwinding system shown here is based on a unique programmable watch winding module fitted with Lithium batteries. The Orbita Casetta Module is shown here mounted in the Casetta Case. However, in that manner, multiple units can be placed side to side or stacked vertically. 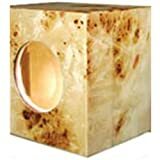 They easily fit in a wall safe or vault and require no external power. 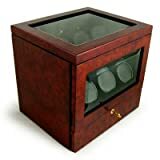 Several wood cases with beveled glass viewing ports and with high gloss lacquer finishes are available for housing single Casetta Modules to provide the attractive fully enclosed Watchwinder shown above. 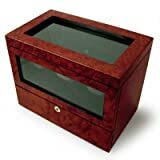 Wood cases are suede lined and fitted with gold plated quadrant hinges and magnetic latches and comes in several finishes.